4 photographs : b&w ; 8 x 10 in. Item consists of four copies of a photograph taken during the unveiling of plaques in honour of Dalhousie University's first three presidents. The photograph shows J.W. (Lucky) Logan (BA. 1894, MA 1909); Miss McCulloch (granddaughter of Thomas McCulloch, Dalhousie's first president); Mrs. James Ross (daughter-in-law of James Ross, Dalhousie's second president); Miss Jean Forrest (daughter of John Forrest, Dalhousie's third president); and Arthur Stanley MacKenzie (President) standing on the front steps of the Forrest Building with the three plaques. Item is accompanied by a piece of paper with information about the photograph's subjects. 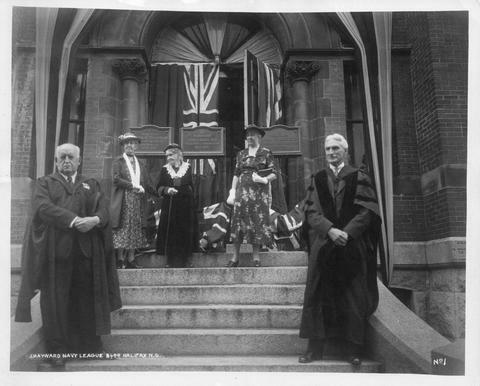 A note on the back of one copy of the photograph reads: "unveiling plaques to Dalhousie's / three first Presidents on front / steps of Forrest Building / Front. L to R / August 16, 1938 / L. W. (Lucky) Logan B.A. '94 / M.A. '09 / President A. Stanley MacKenzie / In background. Relatives of Dal's / first three Presidents Thomas McCulloch / Ross, and Forrest."